St Nons Bay Cottages are a group of 4 self catering holiday homes in a stunning part of Pembrokeshire, just a short distance from the sea and the Pembrokeshire Coastal Path. The cottages sleep between 4 – 14 guests and are ideal for families and friends who are looking for a relaxing break. Within a 5 minute walk from the cottages you can reach St Davids. 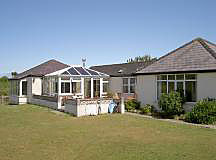 Whitsands sleeps 12 in 5 bedrooms. 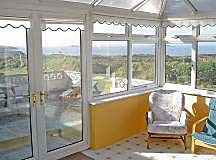 You can enjoy outstanding views over Whitesands Bay to Ramsey Island and Carn Llidi. The large garden is very private and has a lawned play area. There is a conservatory and a large patio area. There is a large off-road car park at the front of the house with parking for several cars. Beth Ruach is picturesque holiday cottage that can sleep 14. The holiday cottage has a spacious lounge that is beautifully furnished and includes easy chairs and a Freeview TV. Enjoy a log fire in the Baxi fireplace or evening drinks on the adjoining veranda. Derwen is a spacious holiday cottage that is perfect for 4. It has beautiful views over the coast and offshore islands. There is a large lawned garden, fully enclosed and safe for children. Hendre Ioan is a traditional Pembrokeshire cottage which sleeps 6. It is set in a high position in a very private and peaceful location with outstanding views over open country and Carn Llidi. The house has a very large split level lounge and dining room with central fireplace and high ceilings. The cottage stands in its own attractive hedged garden and has a lovely terrace area to relax on. The Pembrokeshire Coast has some of Britain's most spectacular coastal scenery and beaches in Europe. They are ideal for children and also for a wide variety of watersports including sailing, surfing, windsurfing and sea angling. The large sandy beach of Whitesands is a few hundred yards away and reached by footpath. This has golden sands at all stages of the tide, with easy access for pushchairs from the adjacent car park. Whitesands is an EEC Standard Blue Flag Beach (free from contamination and manned by lifeguards). The tiny picturesque Porthclais harbour, beloved by children for “crabbing”, has a slipway for launching small boats and free boat park. There is also a famous lifeboat station at Porthstinian. Boat and fishing trips to the offshore islands are organised by local fishermen.